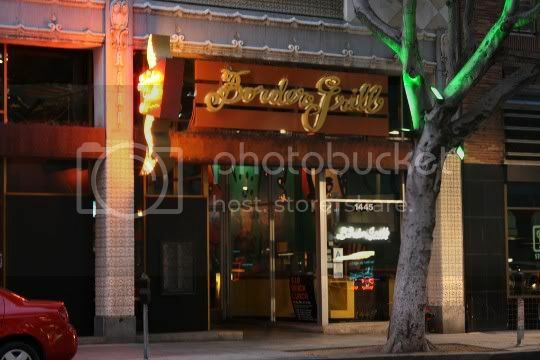 One block off of the busy, tourist-laden Santa Monica Promenade sits the seemingly elusive Border Grill, which hails probably some of the most popular "nouveau" Mexican cuisine in Los Angeles. From the outside, a jazzy neon sign points toward the entrance of what looks like a plain, dim storefront. But step inside this extremely busy restaurant, and you're hit with a cacophony of diners and drinkers, and enough social flurry to keep your eyes constantly distracted. You can tell a lot of thought went into the snazzy decor. The colorful red, blue, and green painted walls are covered with huge paintings, and there's even fun and funky Latin-inspired artwork on the high beams and ceiling. It truly is an architectural and artistic beauty, although the lighting is kept dim and intimate. Aside from the decor, this is one of those places that makes a great date spot. Not only is the location superb (in relation to other evening activities and sights), but they've got a fantastic happy hour (both after-work and Friday/Saturday late-night) featuring deeply discounted margaritas, beer and wine, and appetizers. And any place with a 10pm and later happy hour is okay by me. In fact, I'd go so far as to say happy hour is the best thing about Border Grill because the regular food (at least for us veggies) is...well, read on. Your standard basket of slightly warmed corn tortilla chips: lightly salted, thin and crispy, and not greasy. 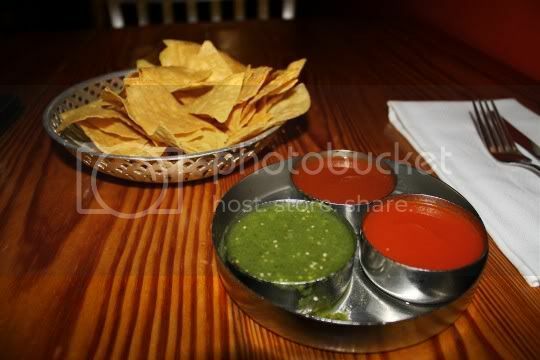 The three different salsas are a nice touch, and definitely expected in a place like this. The chipotle salsa was smoky, spicy, sweet, and full of delicious flavor. The tomato salsa was sweet and tangy, with a smooth consistency and a hint of bell pepper flavor. Finally, the tomatillo salsa was limey and tangy, and super light and refreshing. A nice way to start the meal, it was quite a challenge to not fill up on chips and salsa. I love plantains, so I was excited to try these. Yet my first bite gave way to a surprisingly starchy and dry filling. 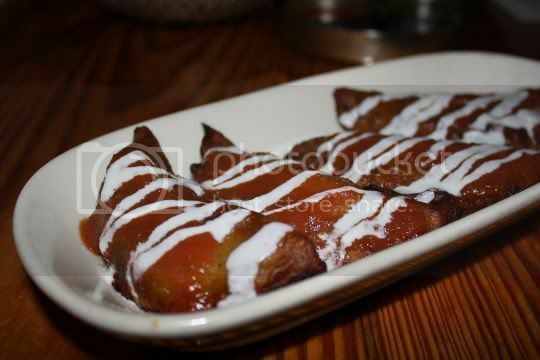 I could taste the plantains, yet they seemed to be somewhat overwhelmed by a puree of black beans. I'm also wondering if the plantains they used weren't the ripest, due to the excessive starchiness. In my experience, it's taken up to two weeks of having unripe (green) plantains sit on my countertop to achieve that deep yellow-black spotted skin...the ones used in these empanadas may have been just turning yellow. The rest of the empanada was just okay: the empanada crust wasn't as cripsy as it should have been and the cotija cheese inside added some salty flavor. Perhaps some of the saving grace was the drizzle of crema and that delicious chipotle salsa on top. I probably wouldn't try these again. 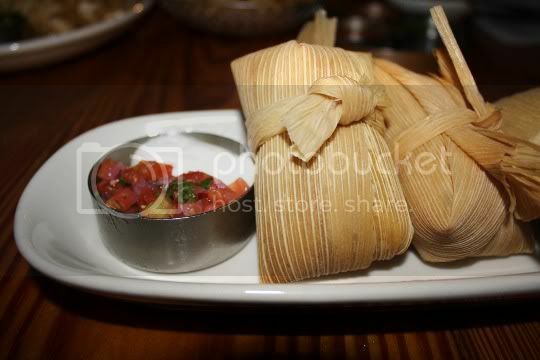 An interesting take on the traditional tamale. For starters, there wasn't any masa surrounding the filling, or at least there was barely enough to notice. Instead, the corn husks were filled with a thick, creamy, sticky mixture of what looked and tasted like creamed corn and whole kernels. Perhaps the sticky and creamy of the mixture is where the masa lended itself. The filling was sweet, but not very well seasoned. Again, I needed to add stuff to the tamale itself to get some good flavor. Maybe Border Grill knows this, because the tamales are served with sides of sour cream and pico de gallo (which tasted as if it had been refrigerated for a while). Again, I had to return to the delicious salsa trio to really kick these up. I'd order this again, but I'd make sure to have plenty of condiments nearby. Well, maybe I'd order it during happy hour, when it's only like $5. This was sooooo not what I expected or wanted to eat. I thought this would be one of those yummy salads with fruit, nuts, greens, cheese, and a tangy dressing. Yet I was very surprised to see mixed greens (or any greens) were NOT a part of the dish. Major bummer. 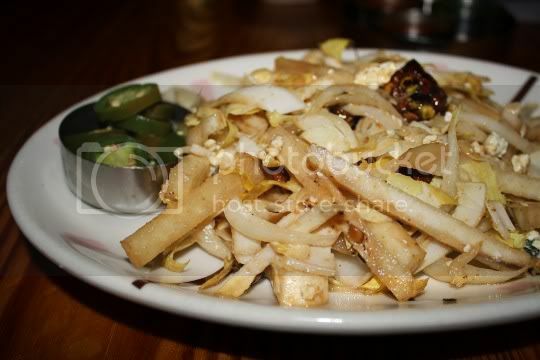 Instead, I got a massive plate of "grilled" sliced pears, shredded endive, almond clusters, crumbled blue cheese, and a side of jalapeno slices (what?). Sigh, there was so much wrong with this dish, where do I begin? First of all, could they have used any more endive? Sheesh, I like it and all, but a mouthful with every bite? No thanks. Secondly, I'm not totally sure how "grilled" the pears were, but I know one thing...they were UNRIPE. Anyone who's ever eaten or bitten into an unripe pear knows what I mean: it's hard, flavorless, and boring. I truly think some nice ripe and juicy pears (grilled or not) would have saved this a bit. My next complaint, the almonds. So with a salad like this, of course you're expecting sweet caramelized nuts. These almonds were both of those things, but they were also BURNT. The smoky flavor coming from them was overpowering and completely ruined every bite of the salad. This may seem harsh, but anyone who's ever burnt or overly toasted nuts can understand my dismay. You have to tstart all over because that burnt flavor is overwhelming! Finally, the side of jalapeno slices really threw me for a loop. And no, not the pickled kind, but the fresh kind. Fresh jalapeno slices on a salad? Well, that's a new one. They didn't fit into the dish at all, although I think a pickled variety may have possibly worked. I did enjoy the blue cheese in the salad; however, the sweet but otherwise nondescript dressing everything was tossed in didn't do much for my palate. Definitely wouldn't order again. So at this point in the meal, a server happens to walk by and notices I've barely touched my burnt almond salad. She asked me if it was okay (I should have let off then and there LOL), and I just politely said it wasn't really what I was expecting. Bless her heart, she quickly snatched it up, told me she would remove it from the bill, and asked if I'd like anything in its place. Well hey, now's the time to drink! So I ordered a mojito in exchange. And here is another of Border Grill's strong suits: the drinks. 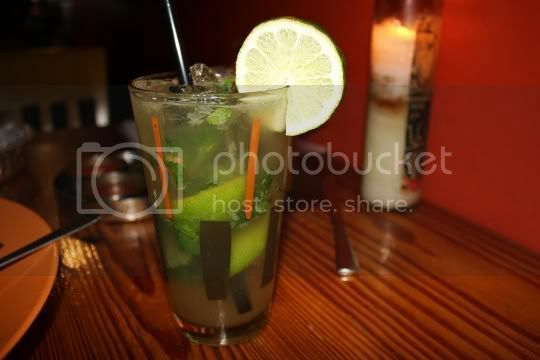 This was probably one of the best mojitos I've had: strong, not overly sweet, and the perfect amount of soda. For the price, it's actually a decent size. Keep in mind, this is one of the drinks you can get half off during happy hour, as well as try the different strawberry and mango flavors. The "main course" for the vegetarian folk. This huge platter of nothing but vegetables and legumes was pretty good, with the exception of everything coming out lukewarm. It IS expensive, but it's enough food that could easily be split between two people. 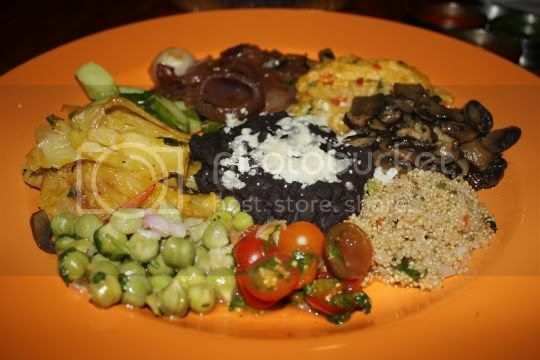 The small mound of black beans in the middle was sweet, savory, hearty, and very well seasoned (finally). The tomato salad tasted a bit like salsa with lime, but a little more bitter. The chickpeas were tangy and well seasoned, although they tasted a bit like they were tossed in an Italian-like dressing. The pickled red onions mixed in, however, were quite tasty. The braised fennel was delicious: somehow they made this so sweet, that I thought I was eating a juicy, lightly citrus-flavored fruit. The asparagus was also well seasoned, albeit a bit salty, but imagine my surprise (well at this point, maybe not) to find that the WOODY STEMS had not been snapped or cut off. What restaurant doesn't know to remove the woody stems?! Sigh, continuing on... The red onion marmalade was either cooked in mushroom broth or with a bunch of mushrooms, as they oozed a rich earthy flavor as well as sweetness. The creamed corn mixture was CLEARLY the same mixture used in the tamales, yet with added diced bell peppers. I guess they are serious about the sustainability factor here. The sauteed mushrooms were good, nothing out of the ordinary. Finally, the quinoa salad with tomatoes and bell peppers was light, tangy, and probably the freshest-tasting of everything on the platter. If you're in the mood for sampling a little bit of everything, then this is a good choice. I figured a "sampler" plate would be the best dessert option, considering each one on its own is $7.50, and I was probably not going to be able to finish a whole slice of anything on my own. So I went with the Banana Cream Pie and the Mexican Chocolate Cream Pie....and let me tell you, they both were TO DIE FOR! The banana cream pie was absolutely amazing. The custard was thick and sticky, but not overly sweet. There weren't a lot of actual banana slices, but everything else more than made up for it. The graham cracker crust was thick, chewy, and crumbly, and was easily one of the best pie crusts I've ever had. 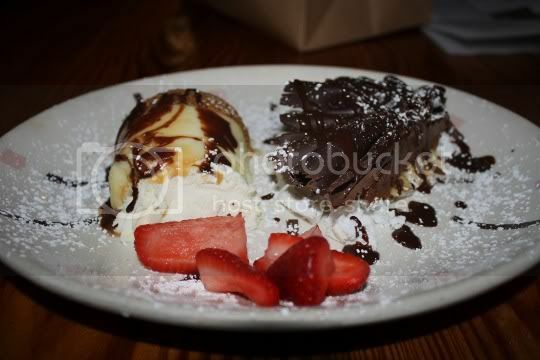 There was just a small drizzle of chocolate syrup, but it was a perfect combination. Everything (aside from the slightly refrigerator taste from the fresh whipped cream) was so clean and fresh tasting, but rich at the same time. I definitely don't think I could eat a whole slice by myself, but it's a great amount to split between two people. My first thought about the chocolate cream pie was its uniqueness. Instead of a standard crust, the pie actually sits on top of a meringue cloud which is sooooo delicious. Light and airy, crunchy and sugary, it's a great contrast to the rich, dark, and earthy chocolate. I actually think the meringue would have made a better topping instead of the thick chocolate shell, as things get a little messy when you try to eat it. But oh well, the tastes are still out of this world. Thinly sliced almonds add a nutty crunch (don't worry, these aren't burnt), and the rich, creamy chocolate mousse is heavily laced with cinnamon. Now one of these, I may be able to eat a whole slice alone! Although the appetizers and entrees didn't quite satisfy me, I know now that Border Grill is definitely good for three things: drinks, desserts, and the happy hour menu ($3 tacos anyone?). In fact, while I did complain a bit about the appetizers, I probably wouldn't have if I was paying half price for them while buzzed off a couple of drinks. The service is a bit slow (granted, they're usually pretty busy), but everyone is super friendly and accommodating, and they really know their stuff. I definitely wouldn't go so far as to say Border Grill is "...arguably the most serious Mexican food in town" (Los Angeles Magazine), but they have their bright spots amidst a sea of modern Mexican imitators.